No it's not the annual Team Profit HQ egg and spoon race, though I do love it. It's the Football World Cup 2018!! The below offers are risk free offers that you can lay for a guaranteed profit! This offer is available until the 9th of June! *Choose an international friendly that is playing today with 1.7 min odds. *Trigger bet must be placed and settle on the same day. *Free bets credited by within 24 hours of your team being eliminated. *Free bets credited by within 24 hours of England being eliminated. *Choose a team (not Brazil) with the close back and lay odds. Germany or Spain will be good choices as they are both low odds. *Place a £25 back bet on your chosen team on mobile. *Lay as normal for a small qualifying loss. Hope Brazil win for your £25 refunded as cash! *This involves placing a lay bet on your chosen team and a small lay bet against Brazil to win, meaning you profit even if Brazil don't win! *Cash refunded (can be withdrawn immediately) credited by within Wed 18th July if Brazil win. Simply back and lay one of the favourites to win for a small qualifying loss. You then get a free bet every time they win! If you choose one of the favourites, they should win 3 or 4 times during the tournament. Tip - To help keep your liability low, place your outright bets on different teams. This is because the exchange only needs to withhold the highest liability team (as only one team can win the World Cup!). See this managing liability blog post for details. Simply back and lay one of the favourites in the goalscorer market for a small qualifying loss. You then get a free bet every time they score! If you choose one of the favourites, they should score 3 or 4 times during the tournament. Note Betfred is 'scored in a match' so if the player scores twice in a match, then you will only receive 1 free bet. Note Totesport is 'scored in a match' so if the player scores twice in a match, then you will only receive 1 free bet. Dabblebet are also running this offer but it is Bet £25 Get 2 every goal scored which likely will not be profitable unless you get a very close odds match. There are some additional refund offers too that may be worth completing based on the odds. Two refunds that look potentially profit are Betfred's refund if England are eliminated on penalties and Boyles' refund if your team are eliminated in the group stage. OddsMonkey have a full list of these in this World Cup post. In total the offers in this blog post add up to almost £50 profit and this is before the first ball has been kicked. 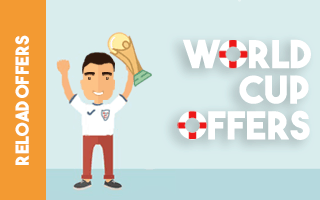 There will be plenty more offers throughout the World Cup - keep your eyes peeled on the blog!